A new pen in town, and what a pen! Fountain Pen Network member Tinjapan announced it last March—the new flagship pen of Pilot´s was in the making. 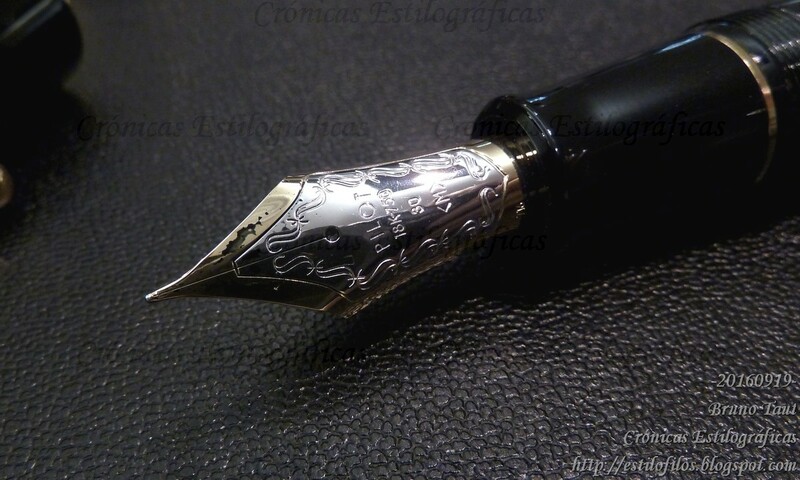 It was going to be a lacquered pen with a brand new nib. Now that pen, by the name of Custom Urushi (reference code FKV-88SR-B-x, where x is the nib point: FM, M or B) was released this past Saturday, September 17th. The brand new Pilot Custom Urushi. 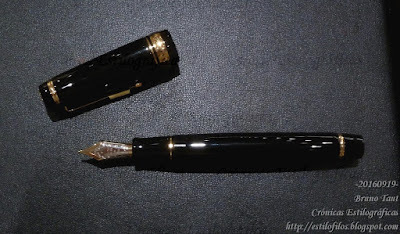 The result is a flat-top pen made of ebonite, coated with black urushi lacquer, and filling mechanism through cartridge and converter (CON-70). In fact, this pen can be seen as a scaled up Custom 845—same shape, same materials, same structure… but bigger, longer, thicker. From top to bottom, Pilot Custom Urushi, Pilot Custom 845, and Namiki Urushi in size 20. And then, the nib—also bigger. An all new size 30 made of 18 K gold, partially rhodiated. It comes in three nib points—FM, M, and B. It is a quite soft nib, albeit not truly flexible. But the remarkable feature is its sheer size—impressive. 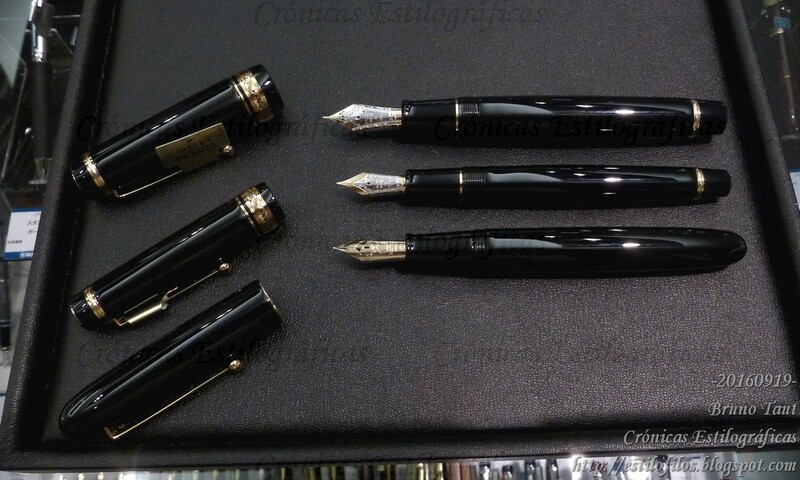 Much bigger than the well-known size 15 (Custom 845, 823, 743) or the size 20 (Namiki Yukari Royale). The Custom Urushi dwarfs these two well known pens. The impressive nib in size 30. It is made of 18 K gold, and comes in three points: FM, M, and B. 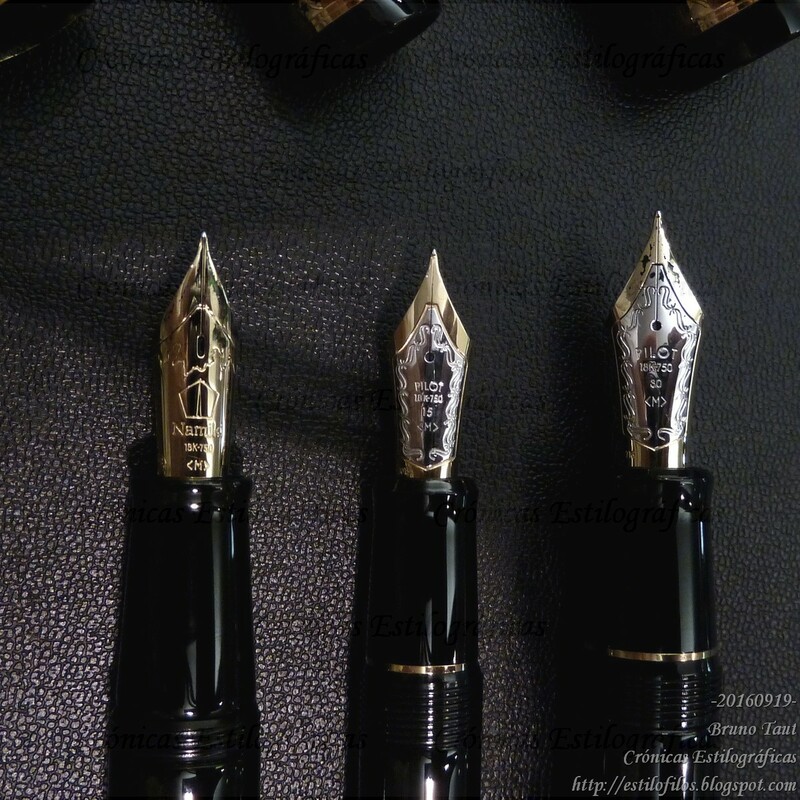 From left to right: Namiki's size 20 nib, Pilot's 15, and Pilot's 30. 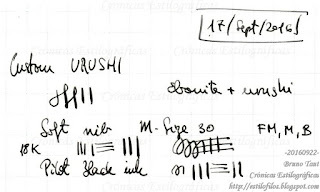 Written sample with size 30 nib of point M. It was made dipping the pen in an inkwell of Pilot Black ink. The printed square is 9x9 sq mm. The price of the newcomer is not cheap—JPY 88000, plus tax. It is certainly more expensive than the Custom 845 (JPY 50000; i. e. 76% higher), but it is also much cheaper than the Namiki Urushi in size 20 (JPY 128000, 45% higher). 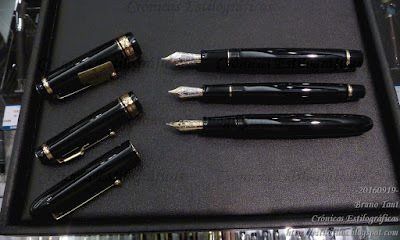 Is Pilot competing against Namiki? 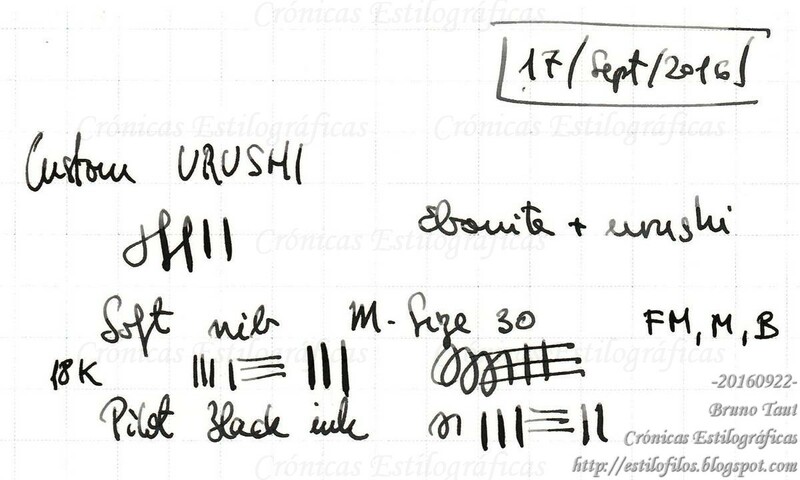 Will the Custom Urushi cannibalize the sales of the black Namiki in size 20? Right now, this size 30 nib is really appealing. Detail of the decorative band on the cap. More information and more pictures on the more recent Chronicle "Sizes 30 and KOP". I understand this a step in the way Sailor moved up with its KOP and Platinum with the Izumi, true and somewhat unexpected hits. Thanks a lot for sharing this. cheers! I do want it, as you all say. Too bad the price is that high. Captain, in my opinion, Platinum is now clearly left behind in the competition for this market. 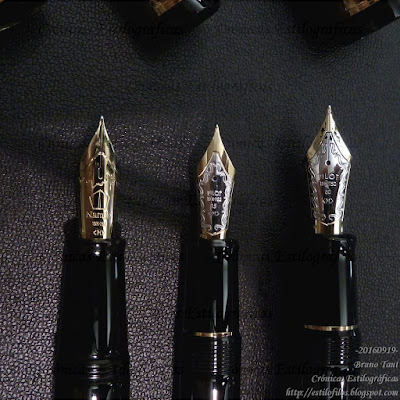 The Izumo is not up to the challenge due to its quite unappealing nib. Great comparison pics! So, you've actually seen one of these? Yes, Tinjapan. You can find it at your favorite pen shop in Tokyo. How does this compare with the Sailor KOP's or 149 nib? This looks even bigger! Thanks, Tony, for passing by and commenting. I had the opportunity to try out this new Pilot Custom (FM nib) at Maruzen, Fukuoka, a week ago; I entirely agree with your assessment that this nib is spectacular, as is its size. For me this one is a better pen than the Sailor KOP: this Pilot offers a better all-round experience. Thank you so much for your posts; I enjoy each one of them. Warm regards. Thanks, Debashish, for your kind words. 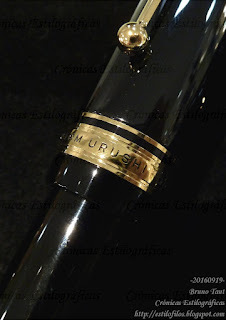 The Custom Urushi is a real piece of work.